Hot Pot parties are fun and filling. As a host, it’s s a great way to spend quality time with family and friends without being stuck in the kitchen cooking while people are eating. 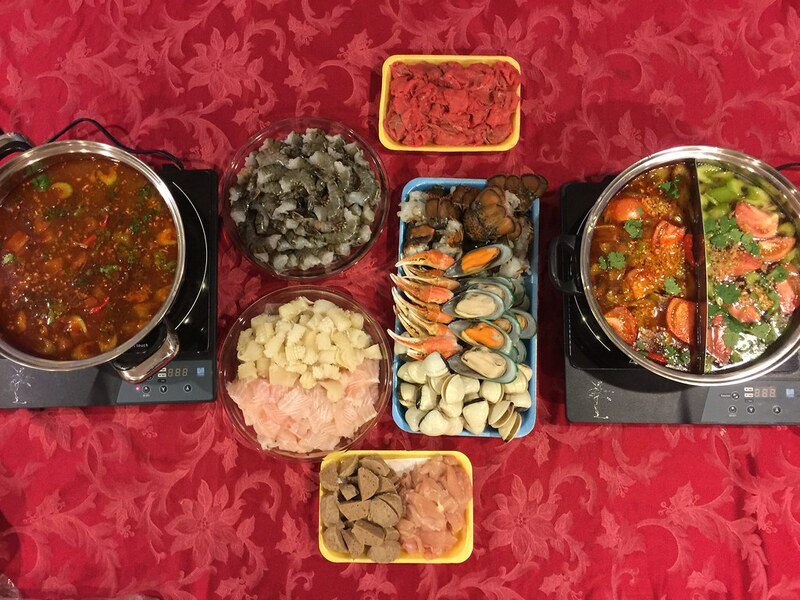 All tedious prep work is done before the guests arrive and cooking will be done directly in the hot pot at the dining table. (Make sure you have an portable stove top) Once everyone is seated, cook meat, seafood, and veggies in the boiling hot pot and hangout. Even though the ingredients list looks quite overwhelming, it’s really easy to put together. You can pretty much adjust to whatever meat, seafood, or veggies you like or have readily available. Typically, my standard hot pot has a little something for everyone and comes with beef, shrimp, squid, fish, and veggies, but since it was Jane’s birthday, I fancied it up a bit by adding crab, lobster, and clams to the list of ingredients. I love the OooOooo AAaaAaaa reactions when they see lobster and crab at the table. The Hot Pot Broth is a Vietnamese version of Thai Tom Yum, a flavorful Thai hot and sour soup. When you go to Vietnamese restaurants, you will often see Lau Thai on the menu, which translates to Thai Hot Pot. This type of hot pot is probably the most popular Hot Pots at Vietnamese restaurants. The recipe below will feed 10 or more people. Your guests will not leave your house hungry, that’s for sure. You can cut the recipe in half or make the broth, freeze half for future use. Place stove top (gas or induction) in the center of the dining table. Prepare all the meats, seafood, and veggies in dishes and place on dining table around the stove top. To prepare broth, add lemongrass, shallots, Kaffir lime leaves, galangal, thai chiles, fish sauce, palm sugar, and pineapple to a large stockpot filled with chicken broth. Bring to a boil. Reduce to a simmer for about an hour. Add tom yum paste, tomatoes, and celery and continue simmering for another 15 minutes. To make garlic oil, add garlic, vegetable oil, and a dash of salt to a small sauce pan and cook on medium low heat until garlic browns. Transfer about 1-2 quarts of broth from stockpot to hot pot pot. Add 2 tablespoons of garlic oil and garnish with cilantro. Place hot pot in the center of the dining table and bring to a boil. Cook meat and veggies in hot pot and enjoy with vermicelli noodles. Fresh lemongrass, galangal, Kaffiir lime leaves and shallots are not required if you don’t have it, but it will definitely enhance the broth significantly. Try to at least have lemongrass and shallots of possible though. This recipe contains a sample of ingredients I used, but it’s entirely up to you what meat, seafood, and veggies are used. The broth is simmered for an hour to extract all the fragrant flavors from the lemongrass, shallots, lime leaves, and galangal. Vermicelli noodles are traditionally used for this style of hot pot, but I’ve tried it with egg noodles and udon noodles as well. Just make sure you cook the noodles according to package instructions, add a little oil so it doesn’t stick before placing it on the hot pot dining table. 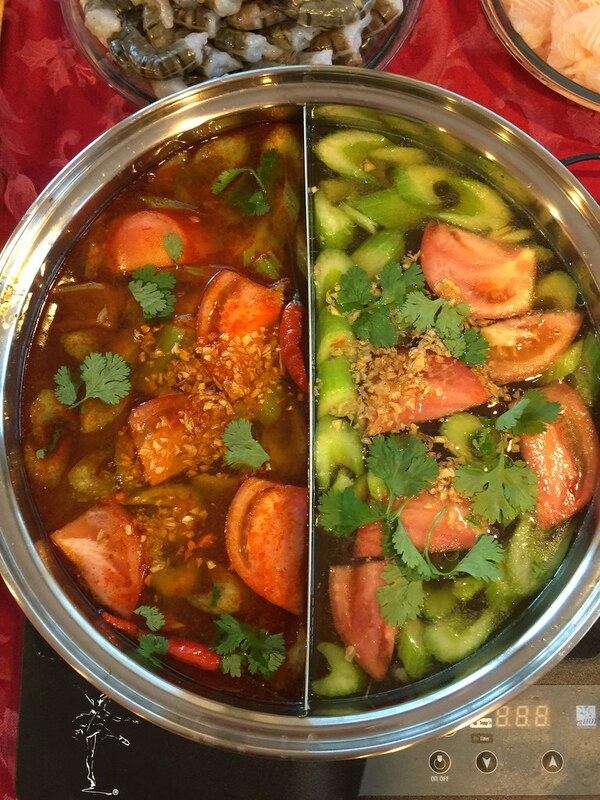 If some guests can’t handle spicy food, there are hot pots available at Asian Grocery stores with dividers so everyone can have a great Hot Pot experience. 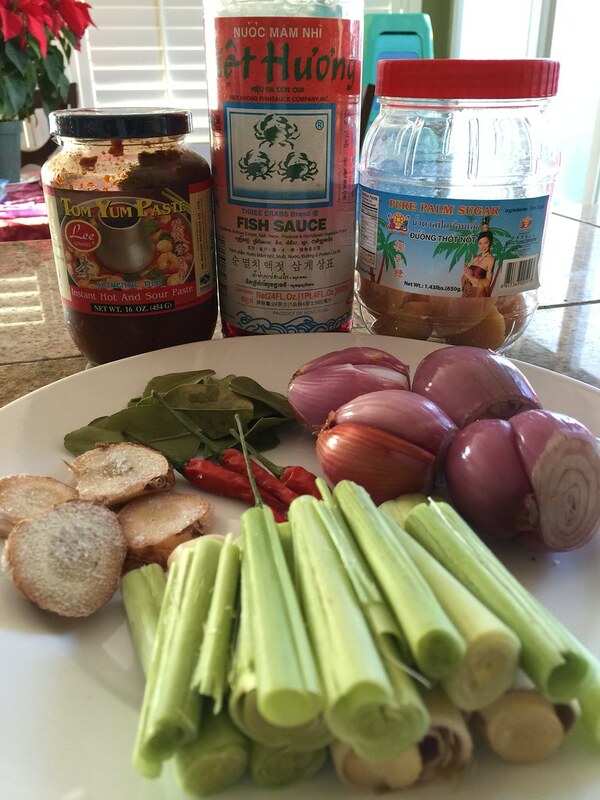 For a non spicy broth, remember to transfer some of the broth out before adding tom yum paste.